Whoo hoo! 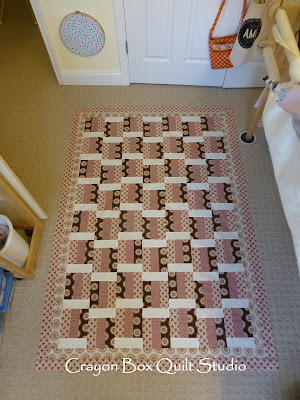 I have another recent finish to show you. This is Cherries & Chocolate and it is a baby quilt for my niece's new little girl Emalee. 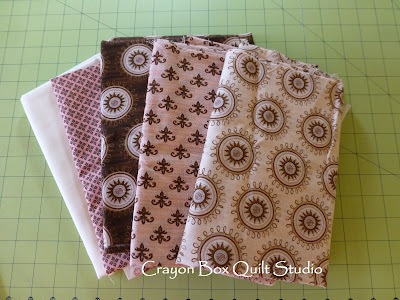 It started with this pile of fabrics from my stash that I got who knows where quite a while ago. It's a new experience for me to have an inspector present while I work. 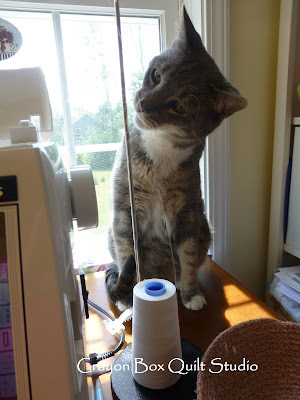 Juno even checked to make sure the thread was pulling of the cone nicely. Thanks buddy! 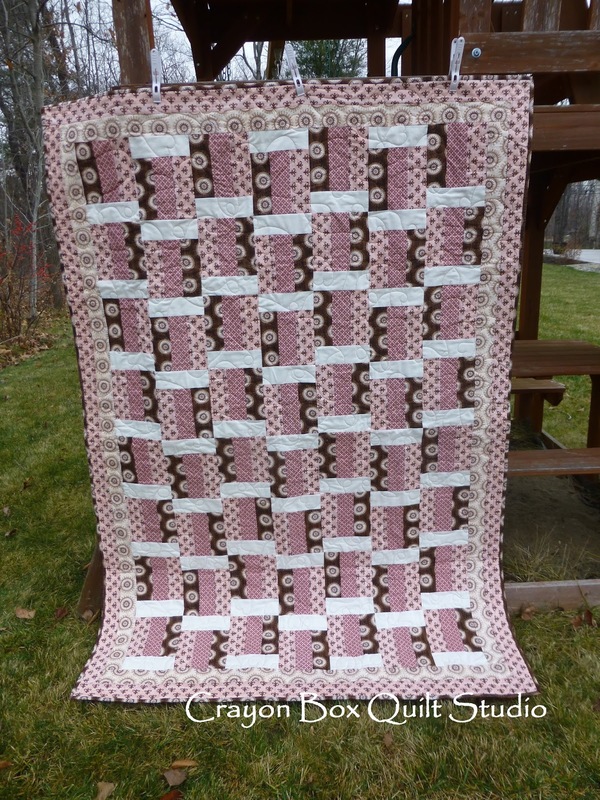 The pattern was Nap Time by Caroline Reardon and was published in Quiltmaker's Favorites Winter 2008. It is a fast and easy pattern and whipped up quick. 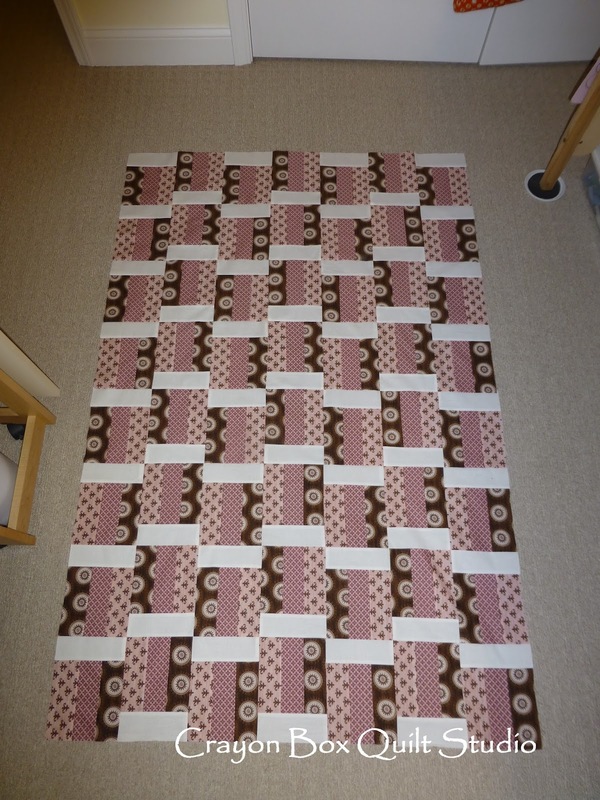 It is a one block pattern made from strip sets. 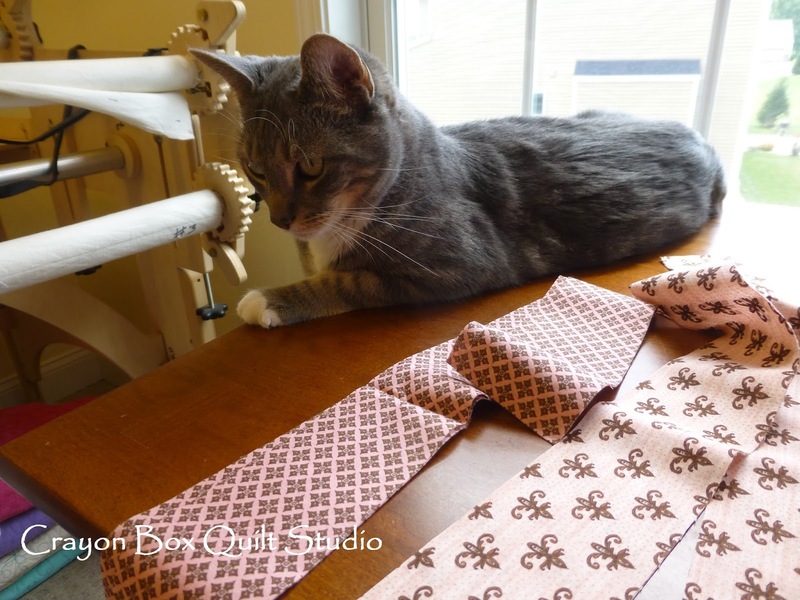 Once the strip sets were sewn together, they were cut into the proper length and then some fast chain piecing was next. Here are the blocks all laid out. 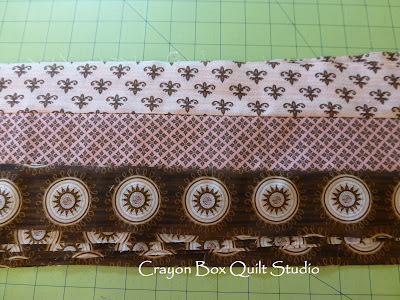 The white strip was just added to the top or bottom of each block, with every other block row the strip set flipped around so that the right most print in the first row was the first print in the next row. And so on and so on. Such a simple design but great results. 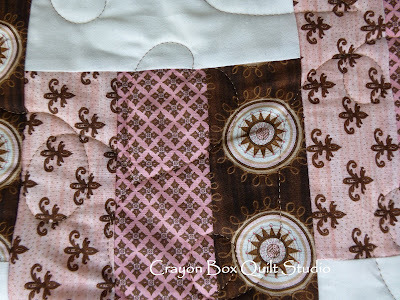 Then with the addition of a couple of borders, the top was complete. 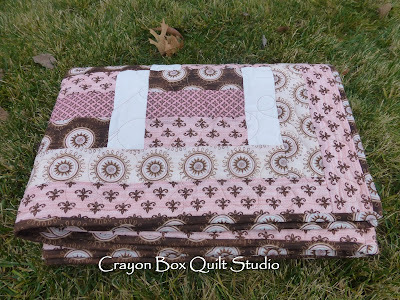 This is another great pattern that I will definitely use again when I need a quick finish. 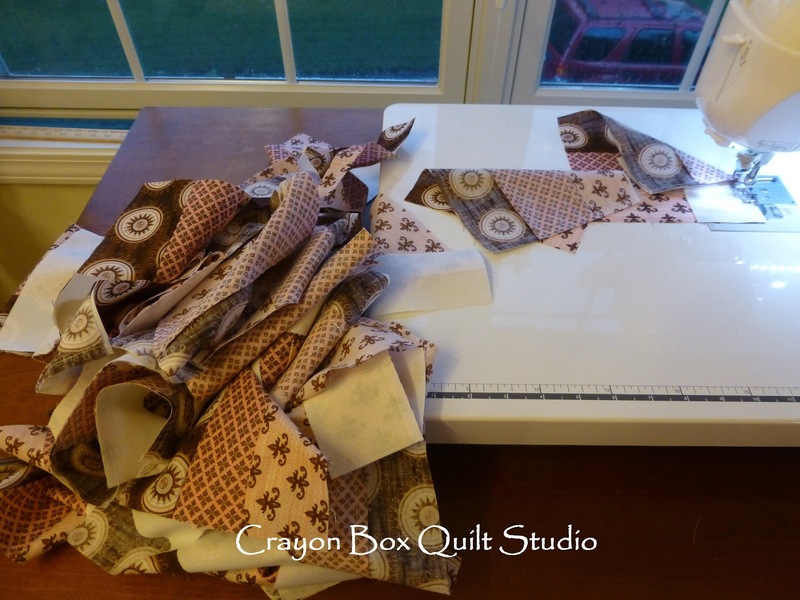 This is the final result after quilting and binding. 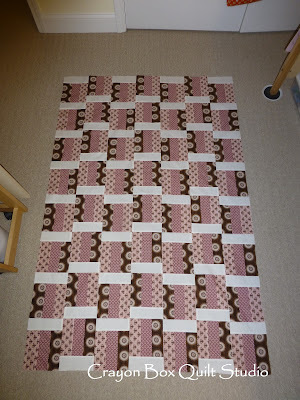 It finished at 50" x 72", a bit bigger than a typical baby quilt but I wanted it to be something she'd be able to use for quite a bit longer. When I quilted this one, I decided not to use a panto but instead took my cue from the loops surrounding the round motif in the Brown print and free handed simple loops and added in lots of hearts too. The thread was a very pale Cocoa. 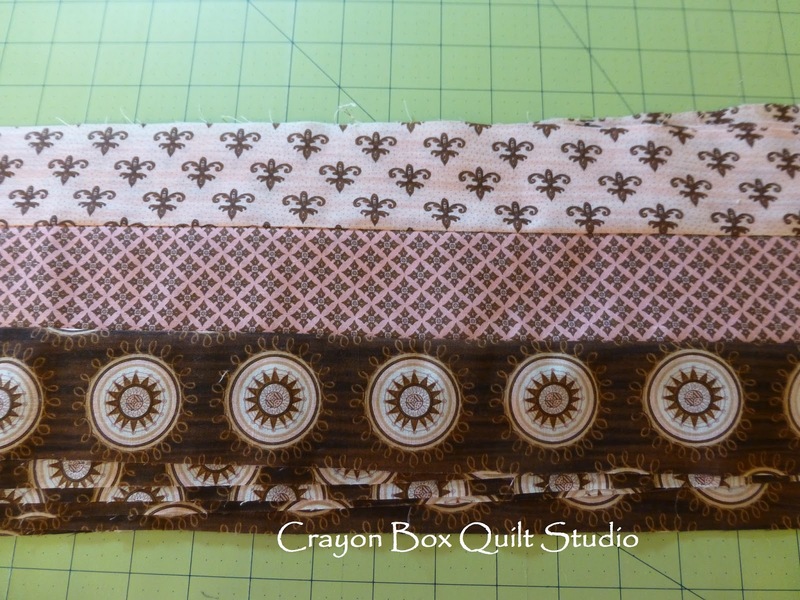 The backing was pieced from the last print I had that coordinated and some of the leftovers from the front. 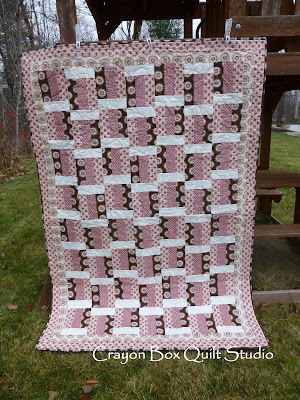 I'm really happy that 100% of this quilt came from my stash so no cash outlay for this and it turned out adorable. I just need to add the label and it will be ready to deliver to my new great niece. Because of the fact that they live a distance from me, I have yet to actually meet the cute little one in person but I can't wait to hold her and to enjoy some snuggle time together. I'll get to do that at our extended family Christmas celebration in a few weeks. From the pictures I've seen she sure is a cutie pie. So another satisfying finish has been recorded. Now onto the next one! Juno a big help! Great finish! Juno is curiously cute! Great finish that I'm sure will be cherised! 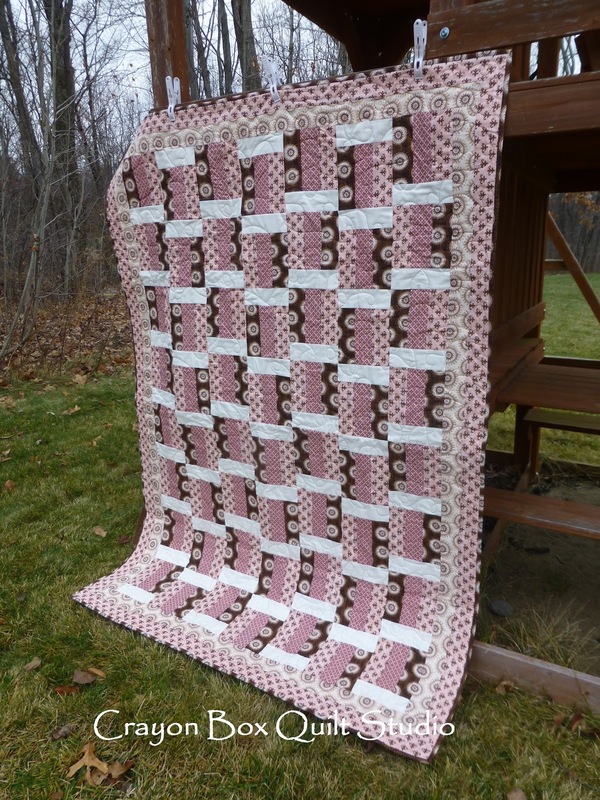 It's neat that you're making for a great-niece. 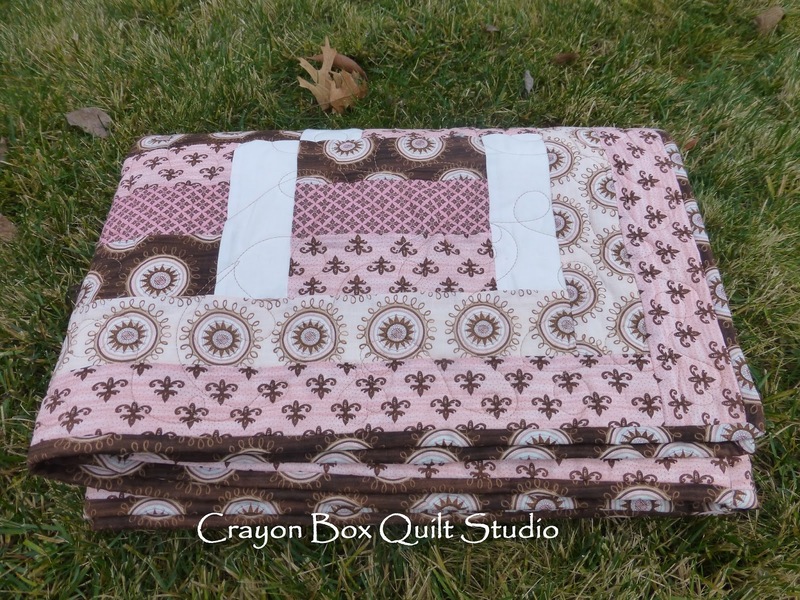 Since I've run out of little ones to make newborn quilts for, like you, I've done the same for all of my great nieces and nephews. This is a cute pattern. Hope you had good family time over Christmas, and that you got in some baby snuggles. 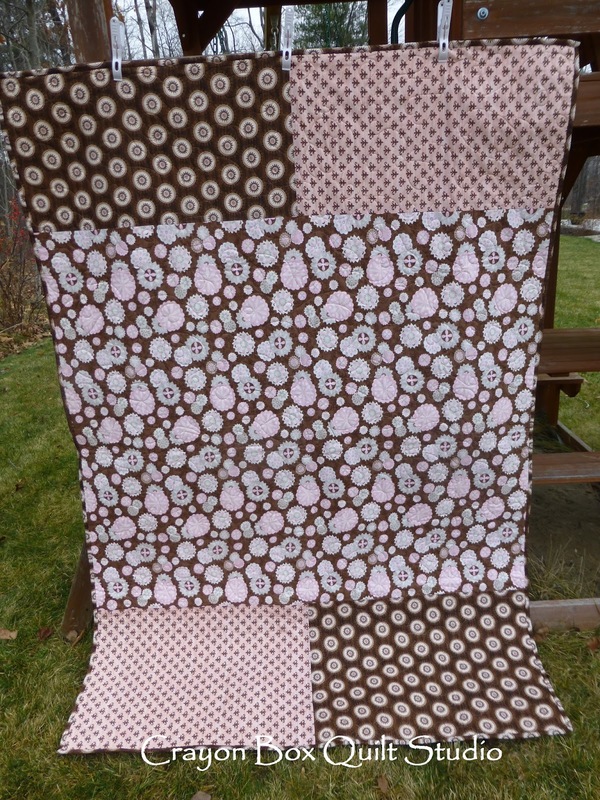 Cherries and Chocolate is the perfect quilt for your Emalee! I bet she will love it forever!